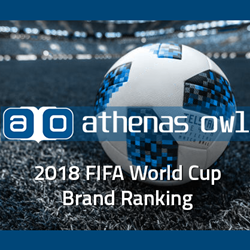 AthenasOwl (AO), an Artificial Intelligence for media solution, announces the launch of the ‘FIFA WC ‘18 Brand Rankings’, where it ranks the top sponsors based on their screen presence during the live broadcast of the matches. Besides overall visibility, the rankings also provide brands with additional information on the field positioning where they were most visible, their visibility levels during match highpoints such as goals and substitutions, and how brands’ ranking progressed through the tournament. AO will be analyzing brand visibility through the FIFA World Cup and publishing rankings on fifa18.athenasowl.tv on a daily basis. Brands can reach out to AthenasOwl for additional insights, data and reports on brand visibility on the Brand Rankings portal, or can write to athenasowl(at)quantiphi(dot)com. AthenasOwl is an AI for media solution by Quantiphi, Inc. AO’s technology can be leveraged by content studios, broadcasters, OTT players, media agencies, media asset management organizations and advertisers among other media organizations for content cataloging, optimization, customization & personalisation, viewership preference mapping & brand impact measurement, among other use-cases. AO counts among its clientele leading movie & TV studios, sports broadcasters and leagues, news content creators, post-production studios, media asset management firms, media rating organizations, and leading brands. Quantiphi is a category defining Applied AI and Machine Learning software and services company focused on helping organizations translate the big promise of artificial intelligence and machine learning technologies into quantifiable business impact.